Developed over a hundred years ago by F. M. Alexander, the Alexander Technique (AT) is a hands-on approach to understanding human alignment. Applying AT principles leads to more reliable sensory perception, body awareness, and movement that is easier, more dynamic and much more enjoyable. The Alexander Technique is an educational process which teaches the student how to identify and undo poor and inefficient habits that may be causing stress and fatigue. Visit Robbin's Facebook page, Alexander Technique Atlanta. What can AT do for you? Lessons are generally taught on an individual basis. Robbin also offers group classes and workshops; individual follow-up is recommended. The Alexander Technique teacher analyzes the student’s movement patterns in daily life: walking, sitting, bending, reaching, lifting. 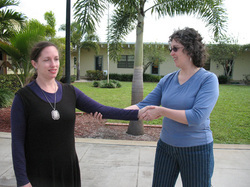 As the teacher guides with a gentle touch and verbal instruction, the student learns to replace faulty habits with improved coordination by locating and releasing undue muscular tensions. This generally results in greater ease and freedom of movement and increased energy. In some cases, AT can help alleviate pain that has been caused by postural stress.